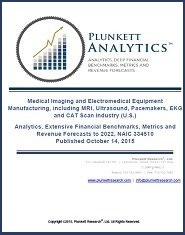 Financial Analytics and Forecasts for Your Industry in this Innovative Report - Plunkett Research, Ltd.
Plunkett Research, Ltd. has launched a breakthrough dataset for deep analysis and financial benchmarking of individual industries. 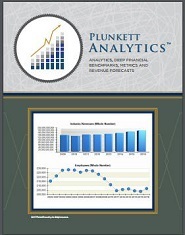 The product is called Plunkett Analytics. You can choose from 500 Industries. These reports will save you hundreds of hours of work, and they are updated and republished yearly. The purpose of these analytical reports is to provide estimates of vital data, within the United States, on a per-industry basis. The data includes all financial statement items, such as EBITDA, revenue forecasts and history, and financial results comparisons of top firms. Click here to get an overview of all 500 industry benchmark reports. This entry was posted in News on May 8, 2018 by NOTadmin.